It is a mid-September day in the medium-sized provincial town of Mielec in the South-East of Poland. But it is a day like no other. The mighty Real Madrid are coming to town. The year is 1976 and three months previously Mielec’s football side Stal had won their second Polish title in the space of four seasons. When the draw for the European cup was made, Stal got one of the biggest names in the pot, the Spanish champions Real. The team from the Spanish capital flew to Warsaw on Monday evening and then travelled by coach to Mielec. Several hours before their arrival in the town a group of local football fans gathered in front of Mielec’s finest establishment , the hotel ‘Jubilat’, to welcome the Madrid side. They were however to be disappointed. Real’s players, slightly under the weather after the long journey, headed straight for their rooms. Except, that is, for West German star Paul Breitner who circled the coach trying to find a bag he believed he had brought along. Having not located the luggage, Breitner shuffled off to join his team-mates. It was a rather nondescript start to the biggest footballing event the town has ever held. How did it come to pass that a club from a small provincial Polish town got to face the footballing aristocrats of Real Madrid on an equal playing field? What drove Stal from Mielec to the very top of the Polish game in the middle of the 1970s? The answers to these questions, as so often in the world of Communist Poland, can be traced back to the beating heart of Polish life back then, the factory floor. That and the delightful talents of a speedy, balding, goal-scoring winger who took the world by the scruff of its neck and would not let go. Stal’s origins stretch back to the final months of peace before the outbreak of the Second World War. In 1939 the Polish government opened a branch of the State Aviation Works in Mielec and the town quickly became the largest centre of air-plane production in Poland. Soon after its establishment in April 1939, the factory set up a football club with the aim of developing a successful sporting community in the town. With the onset of war the club to all intents and purposes ceased to exist but the re-emergence of the factory in post-war Poland brought with it the return of football to Mielec. For the first post-war years the club bore the name Zryw (Surge) and played in the lowest tiers of the Polish game. As part of the Polish Communist state’s industrialisation drive in 1949 the Polish Aviation Works became the Communication Equipment Factory, (abbreviated to WSK in Polish). The factory once more became the largest producer of air-planes in Poland and was renowned for the production of Soviet jets and passenger planes. It also produced refrigerators and even golf carts which were exported to the United States. WSK’s presence in Mielec meant the rapid demographic growth and modernisation of the town. WSK was the glue which bound Mielec together. And what better way to bring people together than to invest in top quality sport? In 1949 the factory’s football team took on the moniker Stal (Steel) a common nickname for factory teams across Poland. Stal were to be the vehicle through which WSK would promote itself. No expense was spared to lay the foundations for a great club. WSK built an extensive network of sporting facilities for Stal, including a 15,000 capacity stadium, training facilities and an excellent youth system. In addition WSK was able to furnish footballers with lavish benefits. In Communist times players were officially amateurs but the factory was able to provide official employment for footballers while players got on with training and playing matches. Finally WSK provided good accommodation for players’ families, in those days an important factor in players’ choice of a club. With this impressive array of support behind them, all Stal needed to do was find success on the pitch. Stal did not have it all their own way in their aim to make it to the top of the Polish game . At first it all seemed rather easy, the fifties were a time of promotion for Stal and their ‘golden XI’, under the guidance of manager Antoni Brzeżańcyk, made it to the Polish top flight in 1960. But their upward surge stopped there. In 1961 the club was relegated to the second tier and, try as they might, they could not make a quick return. Indeed after several mid-table finishes Stal fell to the third tier in 1967, a considerable failure for a side with the backing of an industrial potentate like WSK. The 1967-8 season saw Stal fail to achieve their aim of immediate promotion, and there was considerable discontent within the club. In these turbulent times Stal decided to change their manager. The club looked around for someone to bring success back, at first they sought to bring in a manager who had achieved success elsewhere. They approached former manager Brzeżańczyk for advice, he told them to forget about big names and appoint someone that was young and hungry, someone that would treat the side from Mielec as his big chance. Stal listened to Brzeżańczyk and appointed the 32 year old Andrzej Gajewski who had been a talented player at second division Polonia Warsaw and GKS Katowice. It would be a great choice. Gajewski set the tone for the great side that Stal would become. Gajewski believed the most important thing for a side was speed and physical condition. If these two aspects were perfected, success would come. Gajewski’s Stal were to be a side in constant motion, with players frequently changing position and running themselves into the ground for 90 minutes. In order to achieve this he increased the intensity of training to make sure players could stand the pace. Gajewski was assisted in his task by the playing resources that Stal possessed. If the senior side was in decline in 1968, Mielec’s youth system was producing gems. In the space of five seasons Stal had twice finished second in the national youth championships and three times in third. There was then considerable material for Gajewski to work with including two players who would become synonymous with Stal Mielec, flying-winger Grzegorz Lato and midfield organiser Henryk Kasperczak. Lato was born in the northern Polish town of Malbork in 1950. In the mid-1950s Lato’s father found work in Mielec as a mechanic in the WSK factory and the family moved to south-east Poland. Lato’s father sadly died in 1959 but Stal’s youth system took a chance on his son in 1962 after noting his prodigious acceleration. Lato would stay with Stal for a success-filled 18 years. The second star available to Gajewski was Kasperczak. Kasperczak started his career at Silesian club Stal Zabrze before heading to Mielec. After a year in south-east Poland he did his national service in Warsaw which meant several years playing for army-side Legia Warsaw’s reserve team. Kasperczak almost made it at Legia who were developing their greatest ever side at the time. Legia even offered Kasperczak a contract but he declined fearing a lack of playing time. Instead he preferred guaranteed first team football in Mielec. Gajewski was not afraid to take a chance on players such as Lato and Kasperczak and it would bring the club its greatest successes. Initially Stal’s players found it hard to adapt to Gajewski’s training techniques but the manager stuck with it and results eventually came. In the 1968-9 season Stal won promotion to the second tier and, a year, later made it back to the Polish top flight. Gajewski had got the club back to the big time. Defeats did indeed come for Stal, as the side lacked experience on their return to the Ekstraklasa, but they were able to avoid the drop and finish 10th in 1971. In the 1971-2 season they had learned from their mistakes and were now a side to be feared – they ended up in fifth place. The 1972-3 season saw them finish stronger still as Stal won their first Polish league championship, with Lato as the Ekstraklasa’s top scorer. The season also saw a troika of Stal players, Lato, Kasperczak and striker Jan Domarski take part in the Polish national side’s triumphant qualification for the 1974 World Cup. Indeed it was a move between the three players, cleverly finished off by Domarski, which brought Poland the goal which knocked out England at Wembley. Unfortunately the man most responsible for Stal’s change of fortunes and forging their style, Andrzej Gajewski, was not around to share in the title-winning celebrations. In January 1973 in mysterious circumstances, Gajewski chose to take a job at third tier Motor Lublin stating that his doctor wife had found a position in the city. Stal replaced Gajewski with the Hungarian manager Karoly Kontha who got the side over the finishing line. The next several seasons brought considerable change in the manager’s chair in Mielec with first Aleksander Brożyniak and Zenon Książek being in charge for just over a year each respectively. There was however marked continuity amongst the club’s playing staff. Stal, with their Polish internationals of Lato, Kasperczak and Domarski became a known-brand on the Polish footballing map. In 1974 they finished in third and in 1975 second in the league. Stal was a well-drilled machine, which in Grzegorz Lato possessed the top goalscorer from the 1974 World Cup. Still they had not achieved success in European competitions. All that however was about to change. 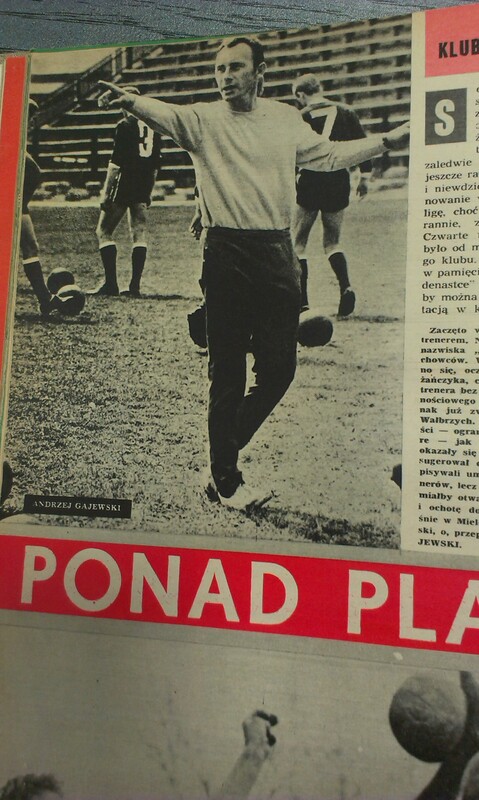 In the off-season of 1975 Stal appointed the former Polish international Edmund Zientara as manager. In his playing days Zientara had appeared for the three largest club sides in Warsaw; Polonia, Gwardia and Legia. As a manager he had won the Polish title with Legia in 1970 and had taken the Polish army side to the semi-finals of the European Cup where they had fallen to eventual winners Feeyenord. Zientara was then chosen as the man to take Stal to the next level. The side from Mielec’s second placed finish in 1975 saw them qualify for the UEFA cup, a competition which did not have the glamour of the European cup but still represented an opportunity for Stal to test themselves against a good level of opponent. Stal were drawn in the first round to play against Danish minnows Holbæk B&I. It was a rather easy draw for Stal but in the build-up to the game the weekly football newspaper Piłka Nożna warned the club from Mielec against underestimating their opponents. Still the newspaper explained there was a massive difference in quality between the two sides and did not foresee any problems for Stal. The newspaper’s gut feeling turned out to be correct. In the first leg Stal came away with a 1-0 victory in Denmark after a goal from their midfielder Ryszard Sekulski in the 76th minute. The return leg was the proverbial walk in the park for the side from Mielec with goals from Witold Karaś and Jerzy Krawczyk bringing Stal a 2-1 victory. Next up were the rather more considerable threat of East German side Carl Zeiss Jena. The club from Thuringia had not won the East German championship since 1970 but were still competitive on the European stage. In the run-up to the game Stal were perhaps slight favourites but their manager Zientara and club officials were expecting a tough contest. In the first leg in Germany Stal played well but a loss of concentration 10 minutes from time allowed Carl-Zeiss Jena to take a 1-0 lead to Poland. In the return leg Stal were able to come out on top but it was close. After a very nervy performance they took the game to extra-time in the 80th minute via a goal from Witold Karaś. 30 minutes of extra-time could still not separate the sides and Stal squeaked through 3-2 on penalty kicks. As the end of 1975 approached the side from Mielec were paired with Slovakian club Inter-Bratislava. Again, this was not a great of the European game but Czechoslovakian football was in an optimistic mood at the time after the national side’s qualification for the quarter-finals of the European Championships. In contrast Poland in late 1975 was feeling down in the dumps after their failure to qualify for the same competition. Stal also went into the match in poor form, having fallen to fourth place in the league after a flying start. Poles were right to worry, despite a good performance Stal conceded another late goal to go into the home leg 1-0 down. Stal’s manager Zientara admitted that it had been a tough old first half of the season, as a result of injuries and players often being away due to international duty. He however assured the press that a win in the second leg against Inter would make things right again. Fortunately Stal were able to get the two goal victory they needed via late goals from Sekulski and an own-goal in the 85th minute. Stal had qualified for the UEFA cup quarter-finals, at that time only the second Polish side in history to have done so. In the quarter-finals they came up against a very tough opponent in HSV Hamburg which, at the time of the match in March 1976, were second in the Bundesliga. The club from northern Germany would go on to win the 1977 European Cup-Winners Cup and reach the European Cup final in 1980. Everyone at Stal knew it would be a difficult against HSV but the side from south-east Poland were quietly confident. In the build-up to the match HSV’s manager Kuno Klötzer travelled to Poland to watch Stal play against Wisła Kraków. Klötzer was full of praise for Stal and was particularly impressed by their attacking right-back Krzysztof Rzesny and their midfield enforcer Zbigniew Hnatio. The match itself, played in front of 40,000 fans in Hamburg, was a test of nerves for Stal but they passed it admirably. HSV took the league in the 11th minute and the crowd, and most Polish journalists, expected Stal to buckle under the pressure. Instead Stal defended maturely and in the 46th minute Lato broke free down the right wing, he moved the ball to Krawczyk who then laid it back to the oncoming Edward Oratowski. Oratowski struck a first time shot into the corner to make it 1-1. Stal were able to hold on to the result until full-time. The return leg was a national event. Stal were just a goalless draw away from the semi-finals of a European competition and the press certainly let them know about it. Przegląd even visited Mielec to give an insight into the daily lives of the players who had become national celebrities. The piece the newspaper produced was rather tame but it illustrated that all of Poland had its eyes on Stal. Unfortunately the side from Mielec disappointed the 30,000 fans that squeezed into their stadium and the thousands watching on television at home. HSV took an early lead and proceeded to apply a tight pressing game on Stal’s players who lacked precision throughout the match. Stal’s UEFA cup run petered out as they disappointingly lost 1-0. They might have been out of Europe but Stal’s players picked themselves up from this disappointment to once more lift the Polish title in June 1976. In the celebrations which followed Piłka Nożna praised Stal as being by far the best Polish club side and deserved winners of the league championship. In an interview given to the newspaper manager Zientara underlined how much of a tough slog it had been for Stal during the season which had included eight extra matches in Europe and a further five in the Polish cup. He admitted he was glad for it to be over. Stal’s rollercoaster however still had a few more turns to go. When Real Madrid came out of the hat in the European cup draw in July 1976 the club’s authorities got down to work. They made sure that there was an efficient ticketing system in place (almost all the tickets went to factory employees) and they added extra seating. Meanwhile on the day of the match they paid volunteers to take up positions around the ground to make sure fans entered via the right gates and prohibited the sale of alcohol in the town. The magazine Sportowiec reported that people were still able to get their hands on alcohol for the game but they normally bought it in outlying villages. The national press did what it usually does when big teams come to town. Przegląd Sportowy published a full-page spread about the history of the mighty Real, complete with a badly-drawn caricature of their star player Paul Breitner. Once more all eyes in Poland were on the side from Mielec. Could they bring down the club so favoured by the recently deceased dictator Franscisco Franco? In a more thoughtful piece for Sportowiec Zdzisław Ambroziak and Maciej Biega noted that actually the differences between the two sides were not that great. Had not Poland, with Stal’s Lato, Kasperczak and Domarski, been one of the bright lights of the 1974 World Cup, a competition for which Spain had not qualified? Sure Real had won the European Cup six times but the last time had been back in 1966. The magazine compared Real Madrid’s trophy room to a beautiful museum which was not relevant any-more. Indeed many fans they met on the way to the game believed Stal would come out on top. This was not to be. Real got an early goal through Santillana and then took control of the game, Stal played in a messy fashion, misplacing passes and lacking precision. Real’s pressing game and better technique allowed them to score a second in the 52nd minute via future Spanish national team manager Vicente del Bosque. It was only in the last fifteen minutes, after a goal from Sekulski that Stal put pressure on Real. Still the Madrid side came away with a 2-1 victory. Two weeks later Stal travelled to Valencia, where the game had been moved due to fan violence in an earlier Real-Barcelona game. Under less pressure Stal played well but a 64th minute goal from Pirri put an end to their chances. They eventually lost 1-0 and crashed out on aggregate 3-1. Although it did not seem that way at the time, this was Stal’s last appearance in the European cup. Kasperczak left for France in 1978 and two years later Lato moved to Belgium. Although the club qualified for Europe in 1979 and 1982 it never progressed past the first round. With several small absences the club remained in the Polish top flight until 1996. However in the 1990s, with the withdrawal of its aviation plant sponsors, Stal got into deep financial trouble until in 1997 the club had to pull out of the league. When it resurfaced again as FKS Stal Mielec it was in the fifth tier. In 2013 things are finally looking brighter for Stal as they sit in the third tier with a renovated stadium bringing in decent crowds of 5,000 fans a game. It is however far from the times of Lato, Kasperczak et al. Unfortunately the Real match was the absolute peak of Stal’s footballing powers, that is unless some miracle brings them back to the top. You never know, it might just happen. It did in 1976. This entry was posted in Uncategorized and tagged Andrzej Gajewski, Emund Zientara, Grzegorz Lato, Henryk Kasperczak, HSV Hamburg, Jan Domarski, Mielec, Real Madrid, Stal Mielec. Bookmark the permalink. Great article. If I ever get enough money i’d buy Stal Mielec and bring them back to the top tier.